Welcome to the Valley Forge National Historical Park Information Page. Here you will find all you need to know about the history of the park. Valley Forge was the location of the Continental Army’s winter encampment from December 1777 to June 1778. At the time, British forces were occupying Philadelphia, 18 miles away, and the site was chosen both for its proximity to Philadelphia, and its natural defenses. The winter spent in the valley was bitterly cold, and the suffering of General Washington’s men was extraordinary. But this winter was also a time of transformation, as the Prussian drillmaster Baron von Steuben instilled in the army standard marching procedures and a newfound confidence in their capabilities. In 1893, the independent Valley Forge Park Commission was created by the Commonwealth of Pennsylvania “to preserve, improve, and maintain as a public park the site on which General George Washington’s army encamped at Valley Forge”. That same year, Valley Forge became Pennsylvania’s first state park. In the bicentennial year of 1976 Pennsylvania gave the park as a gift to the nation. National Park Service officially assumed control of the park on the 4th of July, 1976. Valley Forge National historical Park is 3,500 acres in size. Valley Forge National Historical Park rests on three primary types of bedrock. Red sandstone and shale is found along the river and is associated with low, rolling topography and fertile soils that support grasslands, shrublands, croplands, tree plantations and young successional forests. The carbonate dolostone is found mostly in the southern half of the park and causes gently rolling terrain and sinkholes. The western portion of the park (Mt. Joy and Mr. Misery) is composed of the hard and eorision resistant quartzite. This mineral results in well-drained soils and supports the drought resistant plant types on the upper slopes. Running through the park are the Schuylkill River and Valley Creek. The Schuylkill River floodplain has deep soils that support a great variety of floodplain forests. Valley Forge National Historical Park is an oasis of natural space surrounded by the development of greater Philadelphia. The park is a haven for wildlife; to date, over 315 species of animals have been reported within the park, of which 225 species are birds. Such biological diversity may be attributed to the variety and spatial arrangements of habitat types, including deciduous forests, tall grass meadows, wetlands, and riparian zones. Groundhogs, chipmunks, skunks and foxes thrive in the park. The variety of habitats in the park make it a premier place for birdwatching. Songbirds, birds of prey, and waterfowl are all found in their appropriate habitats in the park. Valley Creek and the Schuylkill River are home to smallmouth bass, carp, catfish, suckers and chubs. Valley Forge National Historical Park is also rich in butterfly species. The variable topography and diversity of soil types make Valley Forge National Historical Park a very rich environment for botanical diversity. Dry Oak hardwood forests consisting of chestnut oak, black oark, white oak, and scarlet oak are found on the slopes of Mt. Misery, while the Riverine Floodplain forests is composed largely of silver maple, green ash, sycamore, box elder, spicebush, false nettle, and stiltgrass. The wetlands of the park support a variety of shrubs and grass species. Valley Forge National Historical Park contains 28 miles of authorized trail. Some of these trails are mixed-use, and provide opportunities for hiking, biking, and horseback riding. 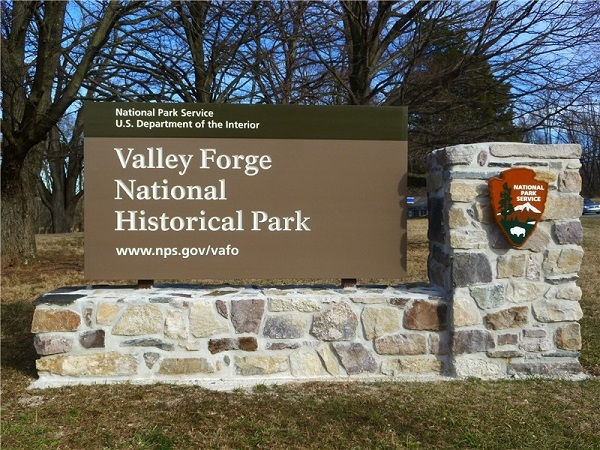 Valley Forge National Historical Park contains 19.5 miles of designated, marked hiking trails. Key historic and interpretive sites are connected by the 6.6 mile Joseph Plumb Martin trail. The Horseshoe Trail links the area near Washington’s Headquarters to the Appalachian Trail. The park offers trails of mixed topography, ranging from the relatively flat River and Valley Creek trails, to the hilly trails on Mount Joy and Mount Misery. Hiking is permitted in most open areas of the park. Multiple guided tour opportunities are available in Valley Forge National Historical Park. From June through Labor Day, 40-minute ranger-led tours depart from the theatre for the Muhlenberg Brigade following the 11:30 and 1:30 films. June through Labor Day, weather permitting. Bikes may be rented from the Welcome Center parking lot daily from 10am-5pm. Trolley tours are available seven days a week June through Labor Day. These 90 minute tours depart the Welcome Center at 11am, 1pm, and 3pm. Fore more information call 610-783-7503. A ten mile self-guiding automobile tour winds through the park. A free maps of the tour route is available at the Welcome Center. Cassette tapes ($10) and cds ($12) of the tour are also available at the Welcome Center. Living history intepreters are an integral part of the Valley Forge National Historical Park Experience. These interpreters are at the Muhlenberg Brigade from 11am-3pm on Saturdays and Sundays and Washington’s headquarters 9am-5pm every day. Valley Forge National Historical Park also is an excellent place to enjoy a picnic. Whether you want to eat with the whole family or just a nice place for two, this park has what you need. The picnicking areas are spread throughout the park so you can enjoy your meal in just about any environment. Valley Forge National Historical Park Welcome Center is the place to begin your visit to the park. The welcome center plays an 18 minute film every 30 minutes on the hour and half-hour beginning at 9:30 and ending at 4:30. Valley Forge National Historical Park Living history interpreters are at the Muhlenberg Brigade (Adjacent to the Welcome Center) from 11am-3pm on Saturdays and Sundays. Living history interpreters are also at Washington’s heaquarters 9am-5pm everyday. Special soldier programs are conducted at the Muhlenberg Brigade at 12:30pm and 2:30 pm on Saturdays and Sundays. The visitor center offers demonstrations, films, concerts, plays, lectures, and special events. Valley Forge National Historical Park has a typical humid continental climate, with hot humid summers and cold moist winters. Precipitation is spread relatively evenly throughout the year, so wet-weather clothing is always recommended. Spring and Autumn tend to be mild, but can swing towards either warm or cold extremes, so visitors are encouraged to check local weather forecasts and be prepared for all sorts of weather. Sturdy hiking shoes are recommended for hiking the park’s trails during the snowy winters.